Celia at Fig Jam and Lime Cordial hosts the In My Kitchen series, and it’s a lot of fun to read, so head over there and check it out! This beautiful and very effective ginger grater that my cousin Elaine sent me. I love how deep it is, and I have to concur with her opinion that it is the best one she has been able to find. Isn’t it nice to have good looking things in the kitchen! Every year at Chinese new year, my kitchen becomes host to a little swamp of dried ingredients in bowls of water. 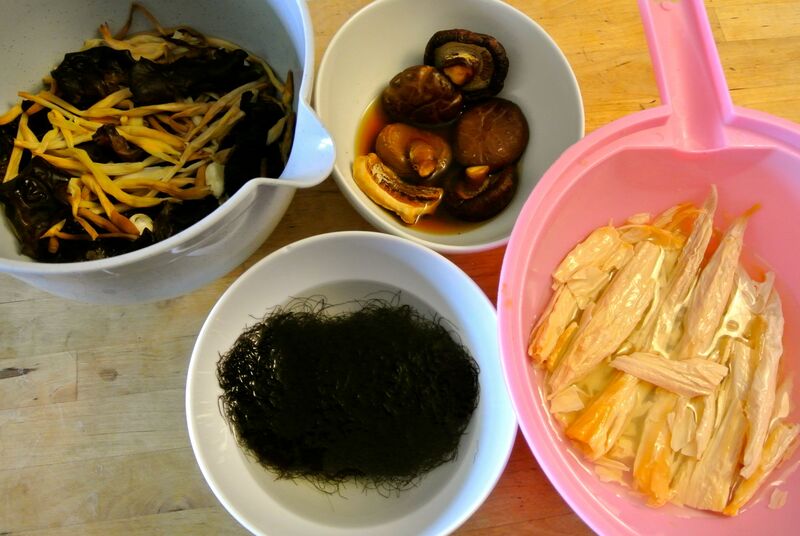 Lily buds, tree moss, “tree ear” fungus, mushrooms, doufu sticks, lotus seed, peanuts — these are some of the building blocks of Jai, a Buddhist (hence vegetarian) dish made to celebrate the new year. Making this dish is an act that makes me feel the narrative thread between my life and the life of my grandparents in the most tangible and enjoyable way. The first time I made it, I was 22 and living in a tenement apartment in New York, on Allen St. I had a board balanced on the bathtub in the kitchen to host the swamp, I remember. Making Jai is just a “little bit of this and a little bit of that” process — you cook everything together and add fermented red doufu and slab sugar until you reach a balance that is pleasing to you. The fermented doufu has a very particular smell and a pungent and salty flavor. My kitchen was filled with familiar smells and as I looked up at that same photo of my grandparents, I knew I was smelling and tasting something very similar to something they had enjoyed themselves, long before I was around. Making Jai is also something that joins the people in my family who are still around. My cousin Elaine sent me the ingredients to make Jai this year (by prevailing upon my long-suffering friend Meltem who was visiting NYC to take them back to Turkey and send them to me. Thanks Meltem!). And I can’t make Jai now without remembering the year that Elaine and I made it together at her house and she spaced out while we were gossiping and cooking and put a whole jar of fermented doufu into the Jai instead of one cake of it. We washed it out and started again (I kept the jar and use it to hold my chopsticks in the garden kitchen). a makeshift potting station that comes out after the boys go to sleep (you don’t want to know what happens when they get their hands on potting soil). I have been starting nightshade family veg (well, tomatoes, peppers and eggplants, anyway) in black bags at the apartment; I thought the bags would be good since they are bigger than paper pots, so I can just let the seedlings grow in them until they are big enough to be planted out. I have paper pots in the greenhouse in the garden with some greens, and will start direct sowing a few things under cola bottle cloches. It is nice to have a bit of garden life in the apartment. I don’t keep houseplants here because I tend to kill them — I don’t know why it is, but I can’t look after indoor plants at all. I always thought I had black thumbs and was like plant kryptonite, but it turns out all I needed was a little bit of earth to plant my feet in and put my plants in and I could look after them just fine. nice blog; i hope Donna B. who misses them, sees it. I’ll see her Saturday and will ask. Thanks mom! In My Kitchen posts are some of my favorites to write — it’s nice to have something to focus on every month. Wishing you a happy new year. And how lovely to have such a special photo in your kitchen. But I have to admit the last photo was my favourite, time to get planting 🙂 Happy days! I don’t know of any songs about it, but I think that *this* is “the most wonderful time of the year”! I love the picture of your grandparents- mine also were gone before I was born- and I try to keep some of my grandmothers traditions going- I think that is why I started baking bread back when I was a teenager! AND DIRT! Any one who has a container of dirt in their kitchen is good with me. I grew up in the greenhouse business- and there are many times when my sister and I have had dirt in the kitchen- getting our seedling a head start. Cooking is such a great way to connect with family traditions. The greenhouse business- that must have been interesting! 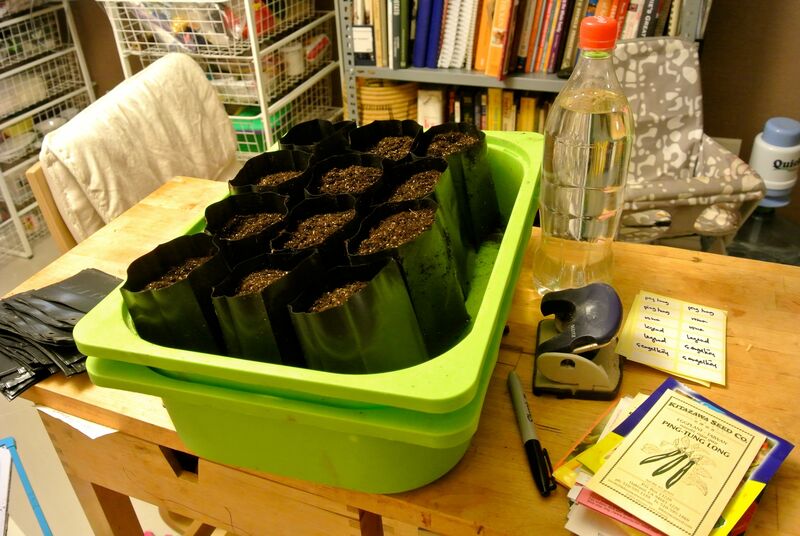 I often start a little too early with indoor sowing- I sat on my hands this year. Little black growing bags! Brilliant idea that. And I very much like the idea of having your grandparents watching over you in the kitchen. A lovely idea. They are kind of ugly and they’re plastic, but they do come in handy. I don’t know what my grandparents would have thought of them! Thanks for a glimpse of where the magic happens. Your Grandparents sound like they were wonderful people and how nice to have them in your kitchen. That last picture is a reminder that today I must order my seeds and get things movng here. There’s still plenty of snow on the ground but Spring will be here before long. It can sneak up on you. I got a reminder when I read that Norma over at Garden to Wok was sterilising pots. We’re all keeping each other on the ball! Beautiful post, Siobhan! 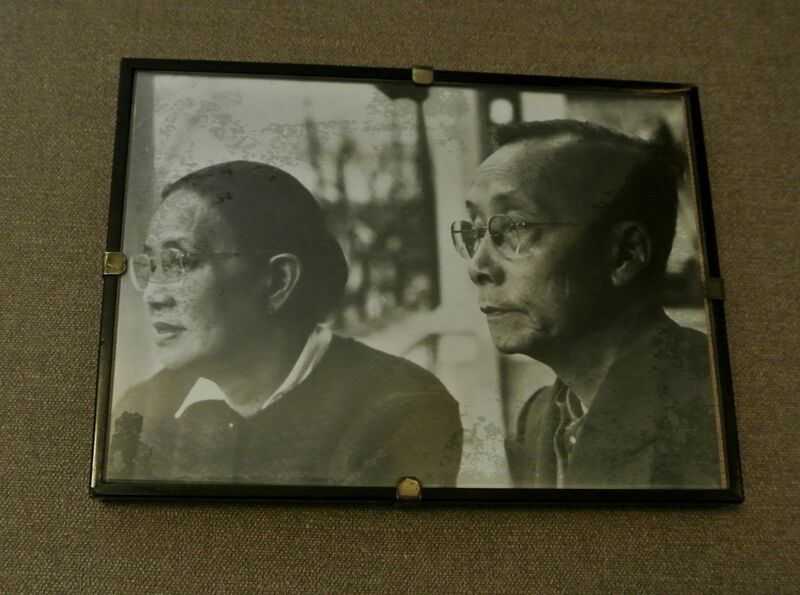 I love that you have Chinese grandparents as well – I don’t remember the ones on my dad’s side, but like you, I have photos to remember them by. And you make your own (as we call it) chap chye! I wouldn’t even know where to start, and I’ve never needed to because we always end up having it a mum’s house every year. 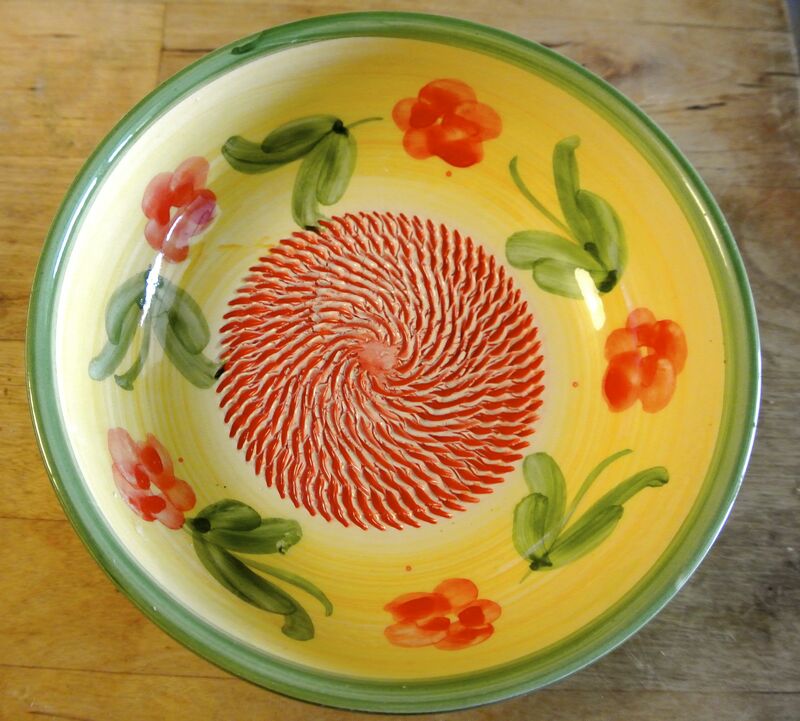 That ginger grater is something else – I was sure it was a gorgeous Turkish bowl – I’d love to know how it works? Thanks for stopping by! The ginger grater is really easy to use — just peel a length of ginger and rub it vigorously on the bottom of the grater. It makes a lovely, fine paste. What’s especially nice is having space for the ginger to accumulate as you work. Happy New Year. I think it is lovely that you have your grandparents photo in the kitchen. I’m sure that they are smiling from above that you are keeping traditions alive. Happy Chinese New Year, Siobhan! So sorry to be coming to this party so late! I hope that you had a wonderful one. I love that you have a photo of your grandparents with you in the kitchen. That is a wonderful photo of them and I can imagine the good power and energy that emanate from them to you. Belated Gung hei fat choi! I just watched the video you posted on your new year post, so we’re even. That was a great song — made me laugh. I hope you had a good new year, too. Gung hei fat choy! Let’s hope there’s lots of good eating this year. Haha! Yes, I have to come up with a better system about keeping up with the flow! That is a great song, isn’t it? Those kids did such a good job! As for the good eating, I think the year is already off to a good start. How was your Jai?